There are many reasons to love them both. And even more to watch as they fall in love with each other. Kids and flamingos is quite a combination to watch at, especially if they come as close as they did this HOLI-day. They wore pink, green and yellow kurtas this sunny morning and trotted in their fancy groups with beautiful fancier caps. 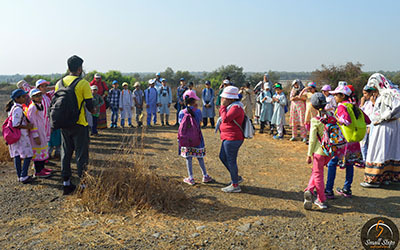 So much like the pinks and whites of the lesser and greaters in the flamingo families which walked first, tap- danced later and then took flights in the airoli creek. Bulging tummies and outstretched on both ends. 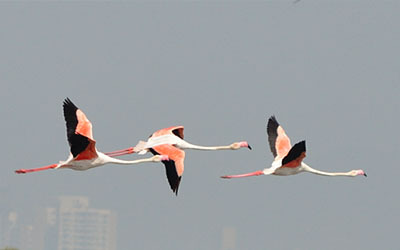 Their throats shooting out towards the flight and the webbed feet flat opened on other end of their long legs, they looked like birds who loved flying as much as their lazy glides in this still developing flamingo sanctuary, nested in the 1,690 hectares long patch of mangrove trees from airoli to vashi. “ Tez chalao, ladkon se aage jaana hai” (Row faster, let’s beat the boys) , screamed the squeaky voices of small girls in one of their boats guided by coordinator of this eco-tour. The kids were so full of questions and we were so lost for answers, as both the boats slowly swam into the greater flamingos territory from their smaller ‘lesser’ counterparts. They had already forgotten the half hour walk into the land and towards the boats, for now they belonged to water – both these species ; kids and humans. Holding onto their spectacles and peering into the binoculars , the kids witnessed how adult flamingos on bent backs, sniffing with their hunched beaks ,filter the algae filled waters of these mangrove country’s mudflats. After plucking out the minerals and then storing them in the now S shaped throats , in that same throats both mama and papas created milk for the chicks so white, soft and of straight bills. For the little girl who asked us – how do they turn so PiNk!!! This is how ! And for the boy who kept wondering – when do they come, and where do they go and where’s their home, listen to this. Your flamingos migrate, they don’t set up homes dear. They visit your creek in winters and stay to meet you till april-may. And yes, they don’t fight with all those other rare birds (almost 200 species) found in this patch. They know how to co-exist lad. Hmm. Well, that’s like making friends. Like when we come here and meet them for almost an hour. Then we take care of their shelters – the mother mangroves that house so many other birds and keep their food clean – the algea by the waters unpolluted and sparkling clean. That’s co-existing. And so we followed orders of our chota-sahab. 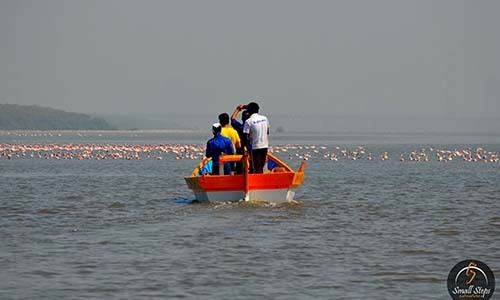 Like this boat of bird-watchers stuck in low tides, these flamingos too have been searching for warm shelters for long and now, finally, they have found us. And we have found them. And now, finally, we make a promise to not only keep them by our sides, but to help them have generations of kids white and with straight bills. And for years we want to watch them up-close feed these children and see them turn into pink flock that floats onto the yellow sparkles of our blue waters. For when hundreds of them fly off the waters and on heads of another thirty thousand swimming below, a thousand more school kids in days to come, will remember again what flying feels like.